Think about that for a second. It wasn't recognized as "boys to men" or "boys 2 men". 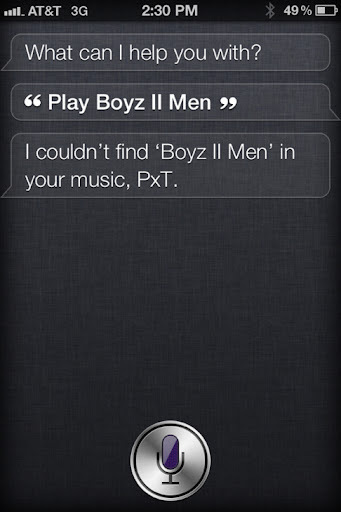 Both the spelling of Boyz and the roman numeral two were correct. If there was any doubt that this is just simple text to speech, think again. It took me three tries to get Bel Biv Devoe (and that third one was extremely over enunciated). 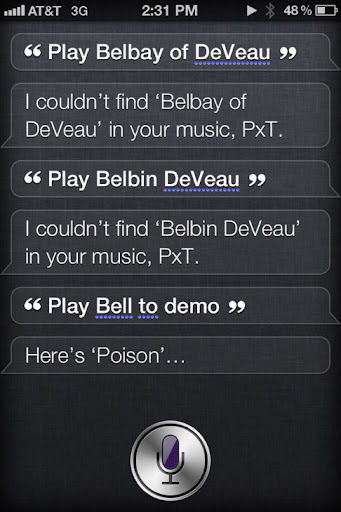 Note that it correctly picked Poison at the end because that's the only song I have in my library by BBD. Shameful, I know. If you have any suggestions for other 90s R&B acts for me to try, please send them along. Update: I was curious to see how Siri would handle this one. The actual album name in my playlist contains asterisk characters, not an expletive; she will bleep out the asterisk portion when she reads back the title. Very clever.